This is a history of Egypt from the Paleolithic to 395 AD. In the early chapters nothing seems to presage the country's later greatness. Agriculture came to the Nile valley several thousand years after the Middle East, most likely from the Levant. There was an intense period of development between about 4400 BC and 3100 BC, at the end of which a unified state, by far the largest one on Earth at the time, was born, already equipped with a unique culture that's instantly recognizable to the modern eye. Aesthetically this culture was far above anything created in the Middle East or in Europe until it was surpassed by the Greeks in the 5th century BC. It's interesting that the initial unification of Egypt was accomplished from the south. "By the end of the Naqada II phase ( c .3200 BC ) or early Naqada III, the indigenous material culture of Lower [Glossy: northern] Egypt had disappeared and was replaced by artefacts (especially pottery wares) deriving from Upper [southern] Egypt and the Naqada culture." There is a pattern in global history of northerners conquering southerners much more often than vice versa, but in Egypt the record seems to be closer to parity than in most places. The south unified the country again after the First Intermediate Period, and then again after the Second one. In pharaonic times Upper Egypt seems to have been more authentically Egyptian and more interested in national unity and sovereignty. Among the roughly half a dozen foreign peoples who conquered Egypt in the period covered by this book one - the Nubians - came from the south. In some periods they even served Egypt's rulers as mercenaries, as did Libyans, Anatolians, Greeks and others. Writing appeared in Egypt contemporaneously with unification, in the 32nd century BC. During my lifetime the scientific consensus on its origin shifted from "probably influenced by Mesopotamian cuneiform" to "probably developed independently at about the same time as Mesopotamian cuneiform". The earliest examples of this writing unearthed so far are labels attached to the grave goods of a king, inscribed with the names of towns which contributed them. An enormous share of what we know about ancient Egypt comes from tombs. This is partly because many settlements cannot be excavated, having been covered by many layers of Nile silt in antiquity. I'm under the impression that burials tended to be located on higher ground, closer to the desert. Also, Egyptians were more obsessed with the afterlife than most ancient peoples. The amount of effort they put into the building of tombs, not just for the pharaohs, is absolutely shocking. The big pyramids at Giza represent a very small share of it. By the way, while reading about all the archeological digs mentioned in this book I was surprised to learn that a few of them were carried out by the Japanese. During the Old Kingdom Egypt was a highly-centralized absolute monarchy with a command economy. "Internal dissent was minimal, and support for the system was genuine and widespread. Coercive state mechanisms, such as police, were conspicuous by their absence." There was no cash, so all economic activity proceeded through barter or royal decree. I've read that by that time Mesopotamians were already using silver as a medium of exchange, though I don't know in what form. There were no coins anywhere in the world until much later. Gradually the pharaohs' control began to slip. Provincial governors, at first appointed, began to pass on their positions to their sons. These dynasties slowly acquired patronage networks of their own, and with them independent sources of power. Eventually central government broke down, order was replaced by chaos, temples were looted and large-scale building activity ceased. After about a century of instability the country was unified again under the Middle Kingdom. Prosperity came back and the arts flourished once more, becoming more human and individual than before. Portraiture was now more likely to reflect the subjects' personal features. Literature began to deal with ordinary people as protagonists. Again Senusret III. Notice that it's clearly the same person, but sadder, less defiant. The Middle Kingdom ended with the invasion of the Hyksos, nomads who hailed from southern Palestine and spoke a West Semitic language. Egyptians called all Middle Easterners, not just the Hyksos, Aamu, which modern historians usually translate as "Asiatics". "Egyptian intolerance toward the ‘easterners’ was already apparent in the reign of Senusret I, who described himself as ‘the throat-slitter of Asia’, and this general perception is reinforced by the so-called execration texts. These were lists of enemies inscribed on pottery objects and figurines, many of which name individual Asiatics and the people of Asia in general. 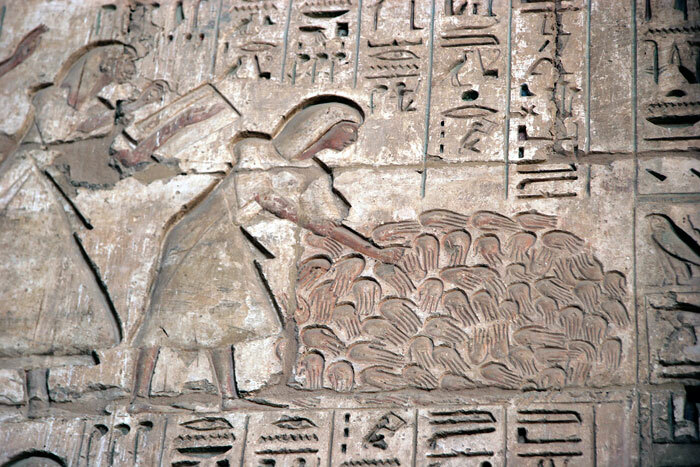 The intention of the texts seems to have been to ensure the magical destruction of Egypt’s enemies by burying or smashing the pots or figurines in question." I'm sure that the Hyksos felt the same way, but their testimony did not survive. Resistance to their rule was led, unsurprisingly, by the south. In other words, the Egyptian side saw this conflict as a war of national liberation. What, your professor told you that nationalism didn't exist before the French Revolution? It is to laugh. In the New Kingdom the already-existing practice of pharaohs marrying their sisters became more common. I would have ascribed this to empty symbolism or misunderstood metaphor if genetic testing on Tutankhamun's mummy hadn't revealed that his parents were full siblings. Pharaohs had large harems, so not all their wives were their sisters and not all their heirs were heavily inbred, just some. The Ptolemies, though ethnically Greek, followed this Egyptian tradition. By the way, this book says that in almost 300 years of Ptolemaic rule in Egypt the only monarch of that dynasty who's known to have learned Egyptian was the last one, Cleopatra. A few local census returns have survived from the Roman period in Egypt. About a sixth of all marriages recorded in them were between brothers and sisters. Amenhotep III is mentioned here as marrying his own daughters, but I don't know if those marriages produced any children. 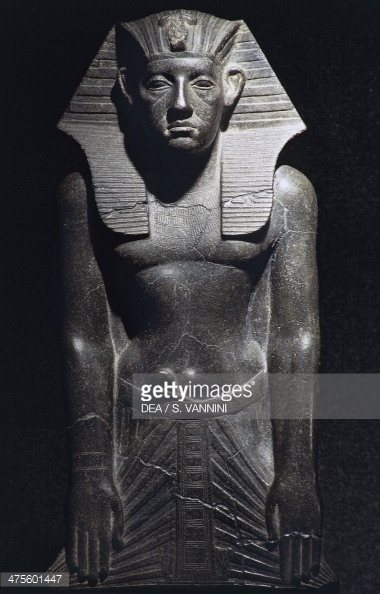 His son Amenhotep IV is the earliest known monotheist in history. 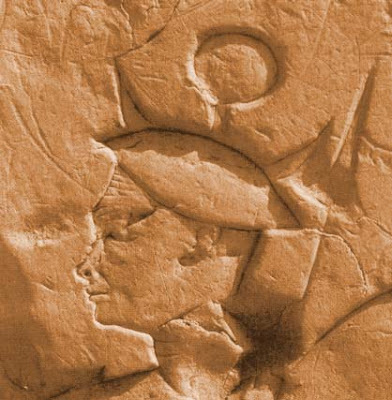 He renamed himself Akhenaten in honor of the sun disc ("aten" in Egyptian), which he saw as the only god in the universe. There had been a gradual movement towards the worship of the sun and towards monotheism before Akhenaten however, so this didn't come entirely out of the blue. 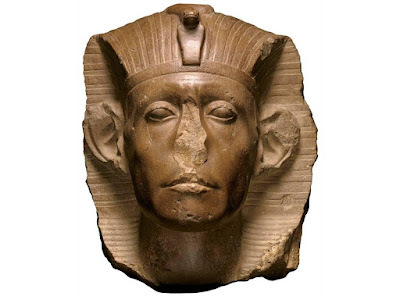 Under Akhenaten "...the traditional gods were banned completely and a campaign was begun to remove their names and effigies (particularly those of Amun) from the monuments, a Herculean task that can only have been carried out with the support of the army. The traditional state temples were closed down and the cults of their gods came to a standstill. Perhaps most important of all, the religious festivals with their processions and public holidays were no longer celebrated either." "In everyday practice, the new religion probably only replaced the official state cult and the religion of the élite; the majority of the people must have continued to worship their own traditional, often local gods." In future eras monotheism was extremely "sticky", meaning that once it took hold in a population, polytheism never returned. But this first known instance of monotheism in world history was an exception, since as soon as Akhenaten died, the Egyptian government and elite came back to their old gods. 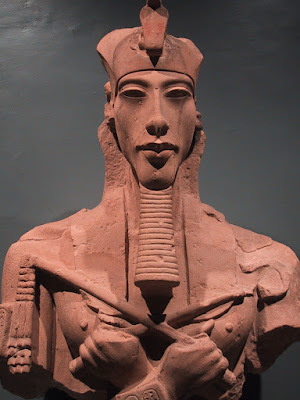 Not content with just that, they tried to obliterate all mentions of Akhenaten, erasing him from official king lists. A few decades later Egypt defeated an invasion of the Sea Peoples, who seem to have come from Greece and perhaps Italy as well. This was a very impressive accomplishment because the Sea Peoples destroyed most of the Middle Eastern states of that time. An Egyptian relief showing a Sherden soldier, a member of the Sea Peoples. The Sherden probably had some connection to Sardinia. I'm not aware of any earlier representations of the European facial type that are this realistic. "The papyrus describes how a state of lawlessness and chaos had broken out in Egypt because of forces from ‘outside’; after several years in which there was no one who ruled, a Syrian called Irsu (a made-up name meaning ‘one who made himself’—that is, ‘upstart’) seized power, and his confederates plundered the country; they treated the gods like ordinary human beings and no longer sacrificed in the temples.... "
"The gods then chose Sethnakht to be the next ruler"... "and he re-established order." The New Kingdom ended with another era of decline and division called the Third Intermediate Period. Different chapters of this book were written by different authors, and two of them seem to offer competing explanations for this. Jacobus Van Dijk blames the long-term effects of Akhenaten's religious reforms. 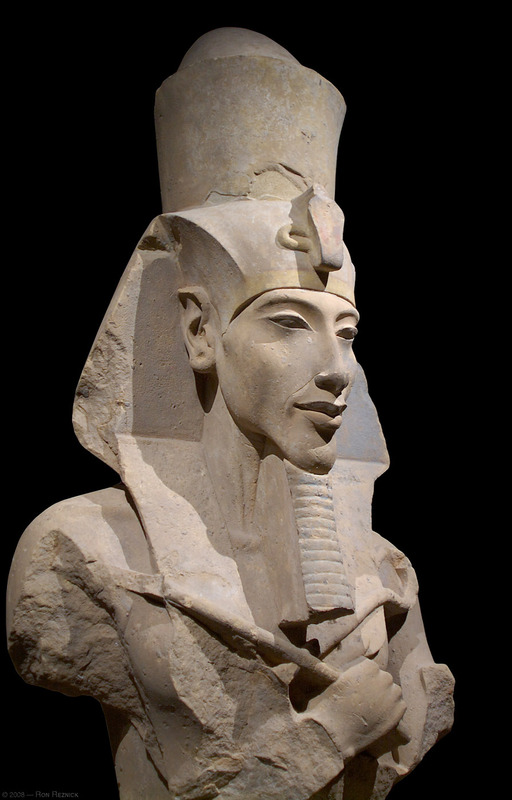 He says that after Akhenaten monopolized all religious devotion for the god Aten, and for himself as his sole representative, people reacted by starting to worship the gods directly or nearly directly, going some way towards cutting out the royal intermediary. This is supposed to have damaged the pharaohs' power and prestige for many centuries to come. John Taylor, the author of the chapter on the Third Intermediate period, instead blames the breakdown of authority on a massive inflow of Libyan nomads into Egypt. These people simply weren't used to powerful, centralized governments. This is the period when royal tombs began to be looted and when the amount of effort put into tomb building declined. Of course Libyans had no reason to feel much reverence for old Egyptian kings, and, as nomads, didn't have a tradition of building anything substantial. This latter theory feels much more convincing to me. I think that in general most historians underestimate the effect of ethnic conflict and demographic change on ideology, economics and the structure of government. According to this book, "a substantial influx of non-Egyptians (Libyans and Nubians) permanently modified the profile of the population." "The evidence of names, titles, and genealogies reveals the population of the north as predominantly Libyan and that of the south as Egyptian. Reflections of this can also be detected in material culture." "There are, in fact, several indications that the Libyans retained a large measure of their ethnic identity. 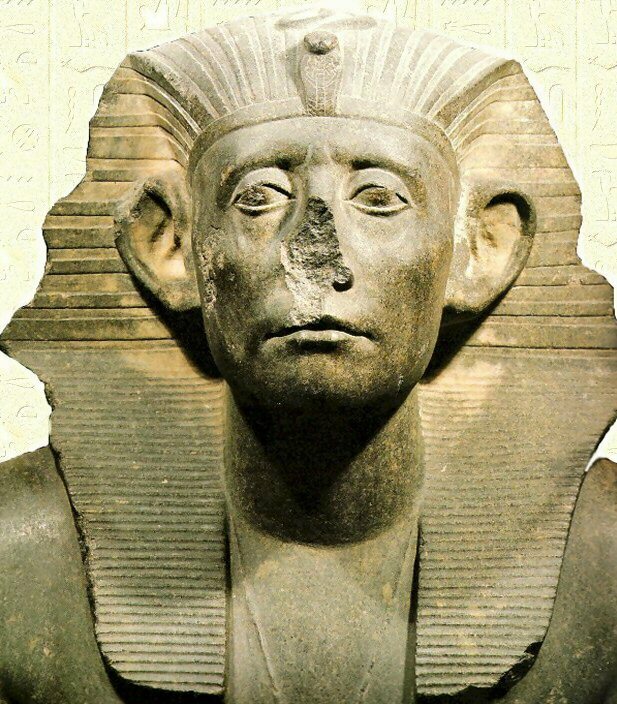 Their distinctive and very un-Egyptian names—Osorkon, Sheshonq, Takelot, and others—survived for centuries after the arrival of the Libyans in Egypt, whereas in earlier periods foreigners usually adopted or were given Egyptian names within one or two generations." "...it has been suggested that by the end of the New Kingdom the Egyptian army was almost entirely made up of Libyan mercenaries." As we move forward through the Kingdoms and Intermediate Periods of Egyptian history, the number and duration of foreign invasions increases. Why? I've read of genetic studies that purport to show that Egypt's population hasn't changed much since the pre-pharaonic Naqada period. This seems to contradict some of the quotes above. I don't know who's right. The genetic study of the past is in its infancy now. A partial replacement of a disciplined agrarian population by nomads could explain some of the change though. Another obvious explanation is the immense civilizational progress in southern Europe, home to two of the powers that conquered Egypt in the first millennium BC. It's important to note however that Egyptian art retained its customary level of sophistication well into the Roman era. The last period of ancient Egyptian independence came to an end in 343 BC. I don't think Egypt was ruled by natives again until the 20th century. And except for Alexandria, all of whose intellectuals were Greek, this ancient country was never again important. It had an amazingly long run though. There still aren't proper studies of the ancestry of ancient Egyptians even though I think it would not be too difficult to get DNA from mummies, of which there are many in European museums. The hope of uncovering the ancestry of ancient Egyptians was what originally got Svante Paabo interested in ancient DNA. 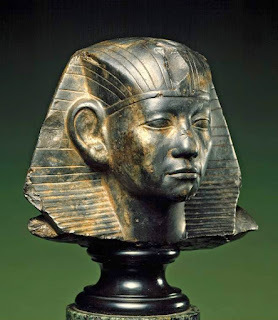 Technically, most of Egypt's rulers after 343 BC (excepting various governors sent by the Persians, Romans, Byzantines, Turks, and British) were born in Egypt, just of Greek, Arab, or Turkish descent. Nor did the place ever return to "Egyptian" rule since the original population has been submerged under waves of immigration. You probably still have some traces of the ancient Egyptian ethnic heritage, especially with the Copts, but the Arabs and the slaves imported from sub-Saharan Africa must be equally important, plus tons of other stuff (the Arabs imported slaves from everywhere, and maybe not all the Greeks fled in the 7th century AD). I've always thought ancient Egypt was a very overrated civilisation, for a culture that lasted millennia; they invented very little, were frozen in a static Theocratic society and fared extremely poorly in nearly all their military engagements with foreigners. But most people are primarily visual in a simple sort sort of way regarding history, and the Egyptians left the largest monuments; utterly useless though they were to contributing anything to daily life. Compare them to the military revolution of the Assyrians, the poetry and civic planning of the Babylonians, explorations of the Phoenicians, the inventions of the Sumerians or the religious syncretisation of the Hebrews; the Egyptians come up short on all counts. But again, most people don't bother to think in more than very basic abstractions when visualising the past. Stable, centralised, well-ordered civilisations just don't produce to much of interest compared to more anarchic cultures. Look at Chinese history as compared to Japan's. ...Funny how in retrospect everything I just wrote could be interpreted or twisted as an argument for leftism. I think Egyptian art was better than Mesopotamian art of its time, than any art that I'm aware of before 5th century BC Greece. A lot of it looks elegant to me. Militarily, they controlled the Levant for long periods of time. And there were other periods when they were invaded and ruled by Levantines and others. The Hittites and Mycenaean Greece were destroyed by the Sea Peoples, but Egypt repulsed them. But in other periods Egypt was weak. It had such a long history that there was everything in there. As for inventions, the current scientific consensus is that Egyptians invented writing independently from Sumerians at about the same time. I'm not aware of any other inventions by them. This book that I reviewed here calls the Phoenician circumnavigation of Africa an improbable story. I guess I wouldn't go that far. It's possible.